In those early years, I can only describe the teaching as “old school.” Waza were shown a few times and then off we went to practice with as much vigour as possible. I recall lots of talk about “extending ki”, but if conversations were held on the topics of connection, liveliness, and blending, I either missed them entirely or just wasn’t paying attention…a much more likely possibility. Keiko was hard back then. Ukemi contained lots of break falls. Bruises and injuries seemed to be more common than today. It forged me into a person who mistakenly equated vigorous hard practice without connection as the correct way to train. 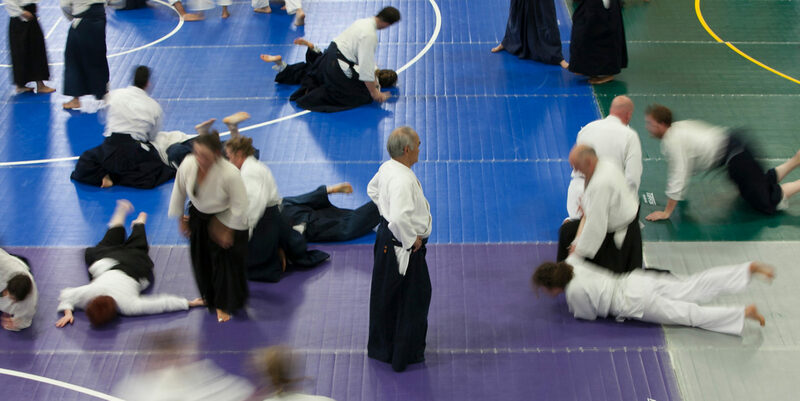 Fleshler Shihan recently said “it was so much simpler when the teachers were all Japanese.” I agree. There was a mystique and mysteriousness about them which made training adventurous. Looking back now though, I see I was spinning my wheels repeating the same things over and over without really looking and seeing what I was doing. I’m not referring to repetition, which is necessary. I am referring to rote training…more like an ox going around and around a grain wheel. The same thing each time. Moving to Los Angeles for my music career led me to meeting my mentor Jack Arnold who opened my eyes to how much time I had wasted to date. Formally meeting Chiba Sensei in 1983 and beginning to train under his auspices really pulled the wool from my eyes. Finally here was someone who…to me…had the total package…dynamic Aikido…a beautifully constructed syllabus…conceptual as well as physical training and spiritualism. Those were renaissance days for me. That’s the “regret” part of this article. I have to consciously monitor myself to see if I am progressing. This isn’t a bad thing by any means, but harder to do when the cement had been set so long ago. It has taken no small effort and plenty of help from my wife, my senior instructors and colleagues to help rid me of some of my ego and look forward to a future of honest practice. It is hard for someone like me to say “I’ve been in this art a long time….I should know this stuff.” It’s even harder for me to look at younger teachers who have had the full benefit of Birankai training and admit to myself that yes…they are a whole lot better than I am. But, in the end, I am willing to embrace what our founder and my teachers tell me, to have Sho Shin and to just be glad that I can get up each day, put on the uniform and train. So…am I too old for this stuff? I don’t think so yet. Each day is a gift. To be able to get on the mat and try my honest best to be open makes it worth everything. Maybe someday I’ll “get it.” I’ll let you know if I do. Great essay. Resonates with me. Thank you, Charles. Reminds us that training is sadhana (discipline) and transformation, however long it takes. Grateful for your wisdom and words. It gives some insight to those of us who are still trying despite lost opportunities or just the decisions we make in life that effect our practice.